It never ceases to amaze how the political side of the aisle that professes “love” can be full of loathsome vitriol towards their fellow Americans. In the aftermath of the terrorist attack in Las Vegas on Sunday that killed more than 50 people and injured more than 500, a self-described teacher named Ann took to social media to pray. 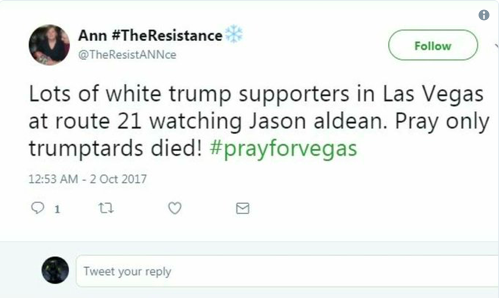 “Lots of white (President) Trump supporters in Las Vegas at Route 21 watching Jason Aldean. Pray only trumptards died. #PrayForVegas,” she wrote on her Twitter page @TheResistAnnce.